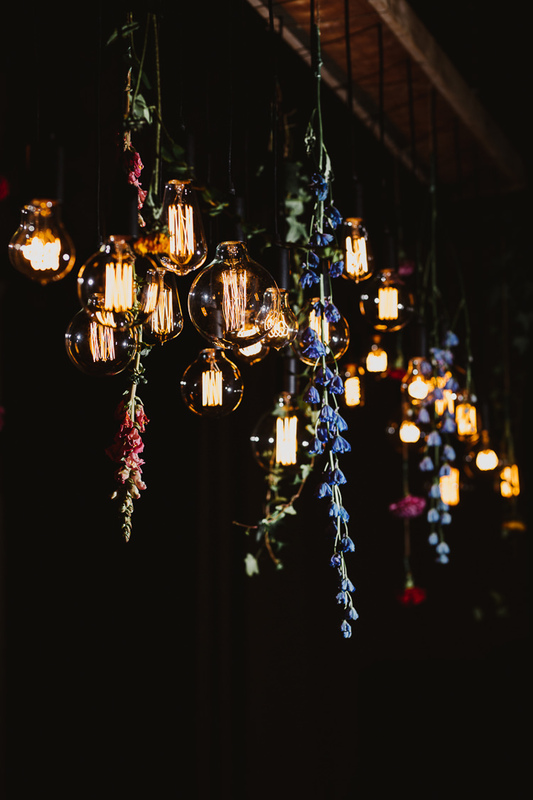 Interactivity and experiential lighting has been a hot topic in wedding design lately, and we adore all the new ways in which couples are experimenting with this. But with the 5th of November coming up soon, we’re also reminded of some traditions that endure, and that can be just as mesmerising every time they’re seen: fireworks and sparklers. Elevating the guest journey means creating unexpected magic at every turn, and what better way to do this than these twinkling shows of light and colour! 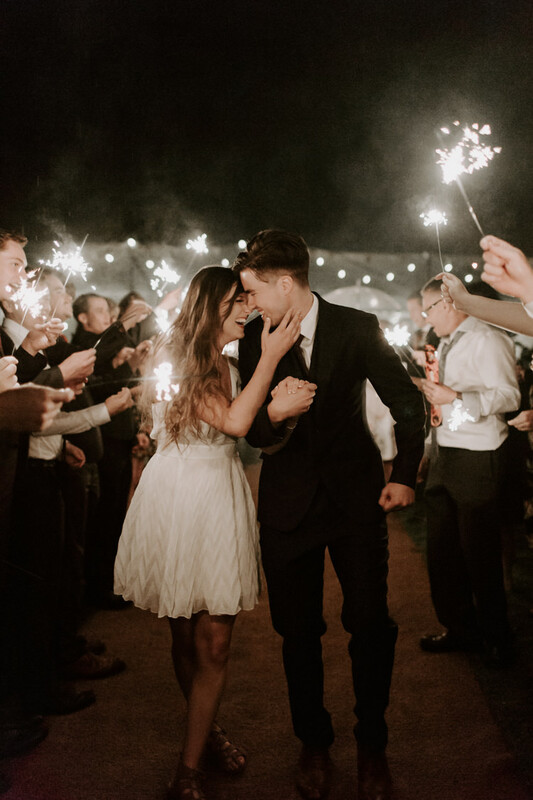 One of the most popular ways that couples love featuring sparklers is as a “tunnel” send off for the bride and groom at the end of the night, or during a transition – for example if you’re asking your guests to move to a different venue for an after-party. 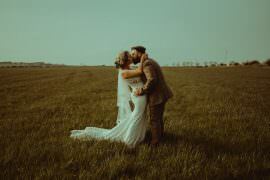 Other exciting options could be to use them as cake decorations, during your couple shots (when it’s just the two of you and your photographer), or as part of your favours (unless there are many guests travelling on aeroplanes who might mistakenly pack them in their suitcases!). 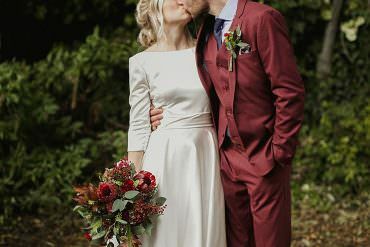 If you’re having an outdoor ceremony or reception, you could also use them to light up your recessional or your first dance, which can lead to some fantastic photo opportunities! Fireworks on the other hand are typically a 2-5 minute show scheduled towards the end of the evening, and can even be booked as a surprise from either the bride or the groom for their partner. 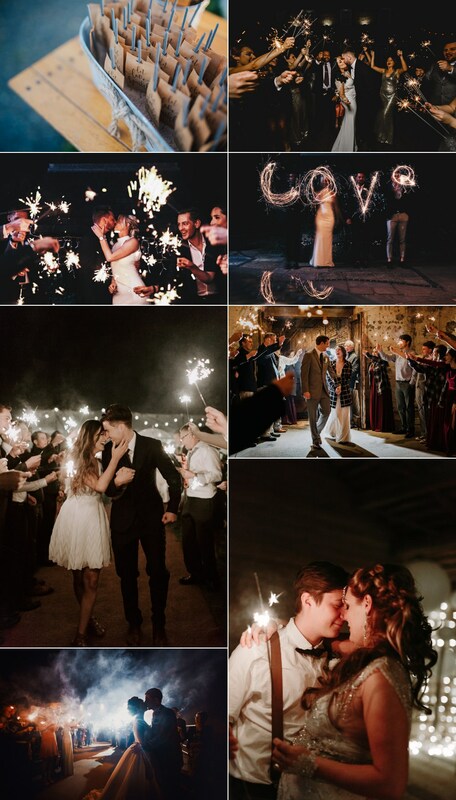 If you think you might feature pyrotechnics at your wedding, why not include a small sparkler in a playful save-the-date or invite suite, so your guests know to expect a little “effervescence”! 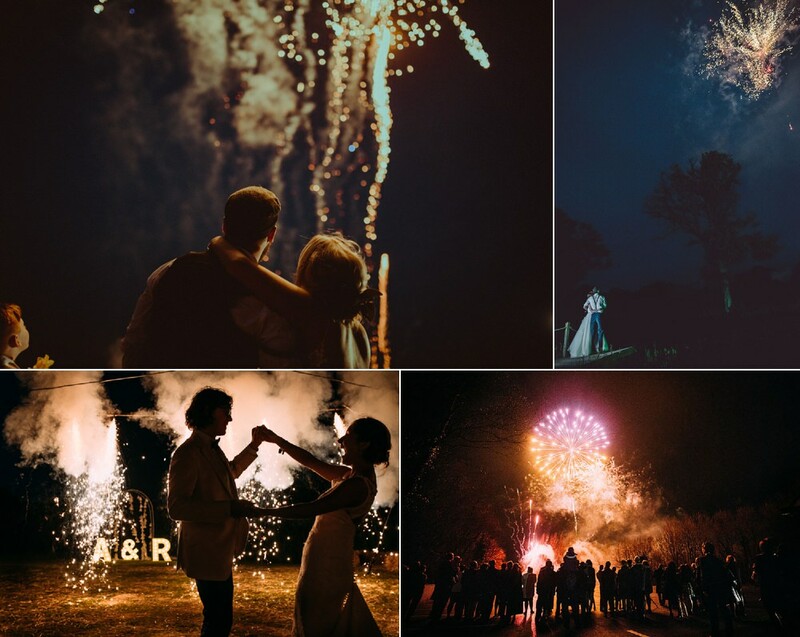 I’ve listed below some tips on having an exciting, impactful, and safe sparkler or firework experience at your wedding – the key thing is to be prepared, and to have as many hands on deck as possible for coordinating timings! 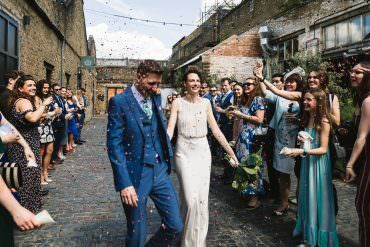 Be sure to check with your venue that sparklers are allowed, as some Grade-listed locations may require a risk assessment or not permit it at all. Generally, venues will ask that you only use them outdoors, and in a designated area where there is plenty of open space. Before your wedding, make sure you let your photographer know how you’d like to include sparklers, just so he/she can bring along the right kit for it and be as prepared as possible. 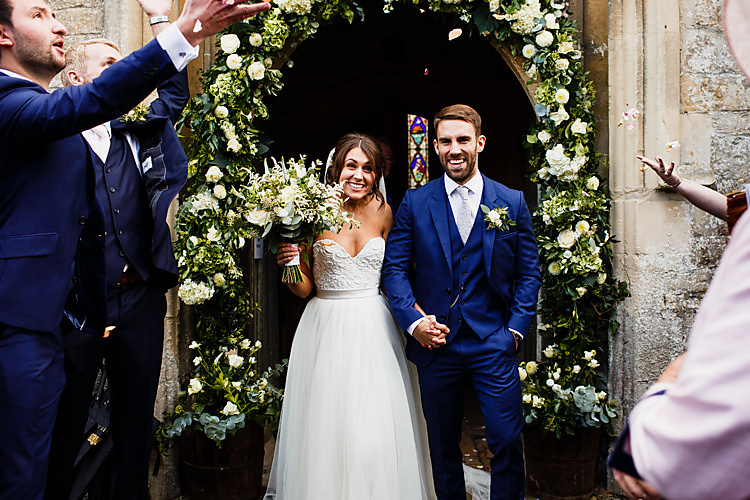 On the day itself, make sure you give your photographer plenty of notice as you’re getting ready. Have plenty of options available for your guests to light their sparklers, and ask your ushers, bridesmaids, or wedding coordinator to help speed up the process. Matches do work of course, but can be time-consuming and unreliable, so torch-style or long-stem lighters are better (ideally provide one per two sparklers). 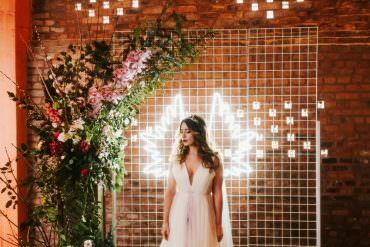 Another option is to have a few large pillar candles nearby, which are a really effective way for multiple guests to light their sparkler from the candle flame at once. If you can space out your usher and bridesmaids along the line so they can help other get lit up quickly, that’s even better. When thinking about where your sparklers will be featured, make sure you allow for extra space. For a tunnel for example, make sure the width is enough that you can have a row of people either side, the lit sparklers themselves, and a space for the newlyweds to walk through safely. Also, consider having metal buckets filled with sand of water nearby so the sparklers can be safely disposed of after use. The metal can stay hot for a long time after they’ve gone out, so it’s important to make sure they’re not discarded on a surface that’s flammable or delicate. If you’d like to create a tunnel or large sparkler group photo, look for the longest, slowest-burn sparklers you can find – especially if your guest list is large (one and a half minutes burn time is ideal, but look for longer burn times if you have more than 150 guests). Regular-sized sparklers can often burn out quite fast, so that by the time the one part of your group is ready, the start of the line has already gone dark (which also means less light for the photographer to shoot in). If you’re ordering these long sparklers, one per person is plenty, and in fact you can order fewer because not everyone will want to take part; if you’re ordering shorter, quick ones, consider buying up to 4 per guest. Sparkler shots usually look the most magical when done either around dusk or after sunset, when the sky is dark. If there is an open bar and your guests have been partying for quite a while already, earlier is usually a little bit safer! If you’re wading through a sparkler tunnel, or walking past a sea of sparklers, make sure you take your time and enjoy the moment. Moving slowly means your photographer can focus more easily AND you get to have lots more fun doing it! If you want a high energy moment, but want to avoid rushing, think about maybe dancing through the tunnel, or stopping in the middle and end to pick each other up, hug, and dip! The first step to planning a fireworks display is to check with your wedding venue that they allow it, as many locations don’t have permission or insurance that covers it. If they do allow it, keep in mind that there may be restrictions on the noise levels, the timings, and the company used. 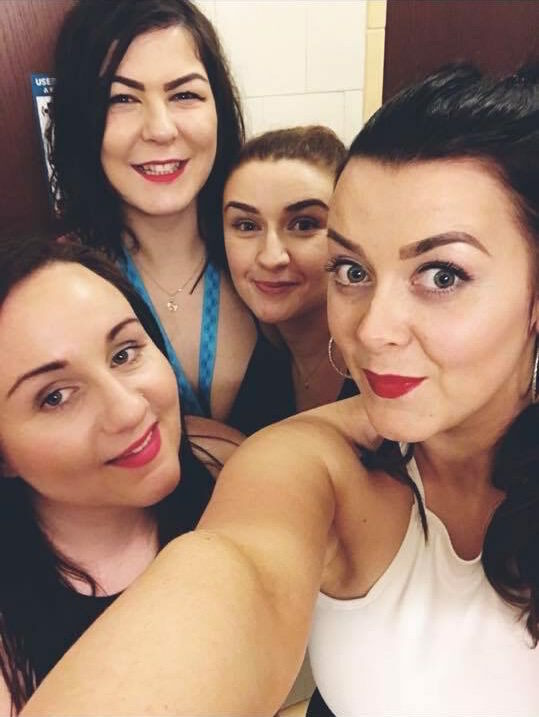 When visiting your venue, find out more about whether they’ve had this before or have any suggestions about the best launch location for maximum impact. Large displays are generally best in open areas, such as golf courses, grassy clearings, or over lakes. Also, using a fireworks company who knows the venue reduces the risk of last minute logistical issues, so do ask if they have any personal recommendations on who to book for this. 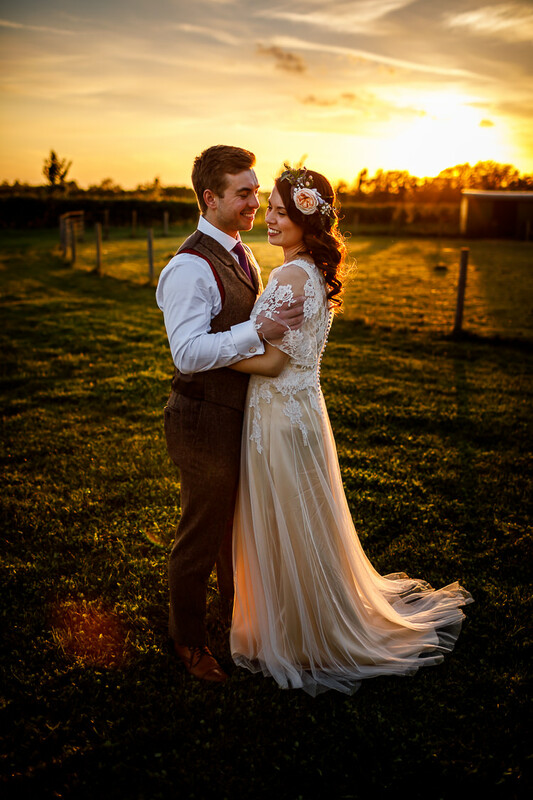 The time of year of your wedding will change how much daylight you can expect to have, so do keep this in mind when planning your timeline. In the winter months, you could hold your wedding fireworks display a little bit earlier, as night falls earlier – which can be great if you think you might have a lot of children attending who would love to be there for it. On the other hand, in winter you’re more likely to have trickier weather, and possibly the kinds of rain or wind that can cause a fireworks display to be cancelled. 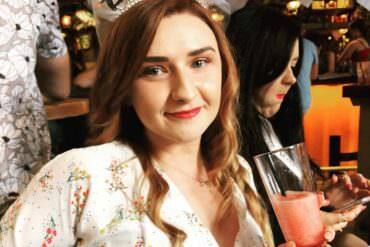 In the summer, you might have to wait as late as 10pm or so for sufficient darkness, which means it’s really key to have someone helping you usher your guests away from the party (and the bar!) to somewhere they can enjoy the show. If you are having a later show, consider adding the fireworks display to your order of the day, so that guests don’t turn in early just to find out they’ve missed it! 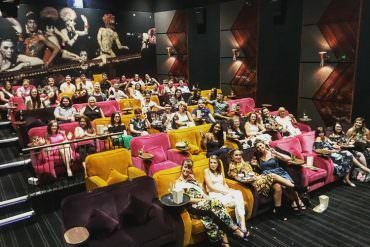 If your venue doesn’t require you to use a specific company, do shop around to find someone communicative and trustworthy, and to get to know what this kind of service costs. Don’t expect similar figures as buying fireworks over a counter, as you’re paying for the cost of a professional company designing, preparing, and delivering fireworks, in a safe and legal way. 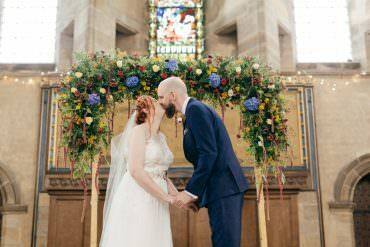 A typical wedding display will come in between £1500 and £4000 depending on the duration and whether music is involved (which makes the logistics much trickier) – but of course, as with anything, it’s possible to allocate a much large portion of your budget to this if you’d like something spectacular! As for the payment structure, make sure you discuss how large a non-refundable deposit is taken, and what the cancellation policy is (in case of bad weather for example). Fireworks are quite difficult to capture in photos due to the short timescales and quick lighting changes, so the more information you can give your photographer ahead of the day, the better! Let them know how long the fireworks will be, where they will be going off from, and whether there’s a good spot where you can stand in front of them. 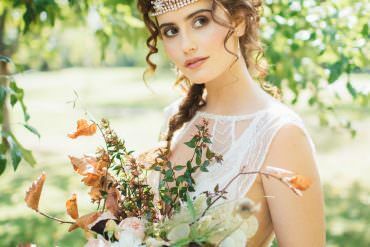 For the best chance of getting good photos of this, ask your photographer about hiring a second shooter for the day, and make sure you find out what time their coverage ends so you can take that into account when planning the timeline. It’s possible that not everyone at your wedding loves fireworks as much as you – particularly pets, babies, or elderly guests. Be courteous by asking one of your ushers or your MC to give guests a heads up that the show is about to start, and think of areas where anyone who wants to protect themselves from the noise can be for a little while. If you’d like to light up your evening, but organising sparklers and fireworks isn’t really for you, why not take advantage of a local fireworks display by marrying on a national holiday, filling your reception space with candles or fairy lights, or lighting delicate lanterns that will drift up into the sky (but be sure to tether them — loose lanterns can be really damaging to local fauna and flora). 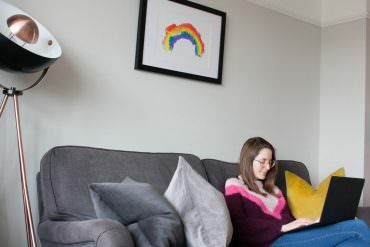 I hope this article has been inspirational and useful! For any questions, tips, or help with your wedding planning and styling, don’t hesitate to reach out to me at The Stars Inside.